A clever picture book that features fourteen poems about punctuation. A great picture book to use as a model when teaching conventions. Read aloud this book with gusto and children are sure to find punctuation exciting! 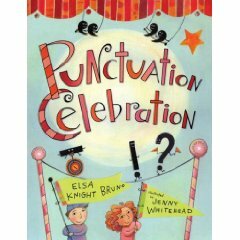 Lesson Idea: After reading aloud this book, have children discuss the different forms of punctuation. Have each child choose one and write their own poem about it. Compile the poems into a class punctuation book to use as a resource when children are editing other students’ work.